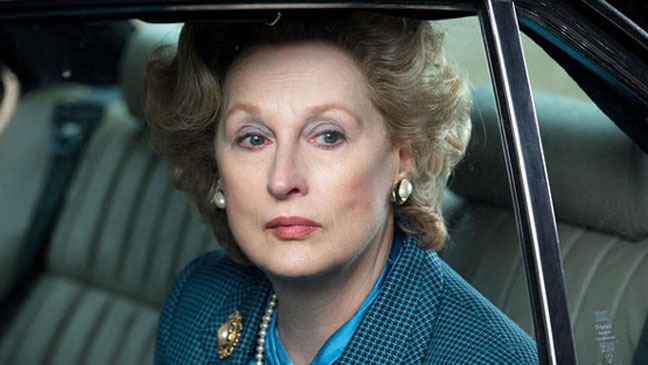 Meryl Streep as Margaret Thatcher in 'The Iron Lady'. A tale told in broad strokes, The Iron Lady is an average biopic grounded by yet another award-winning performance by Meryl Streep, who this time transforms herself into controversial Prime Minister Margaret Thatcher in a performance that deserves a better movie to inhabit. It’s a very loose biography, framed by an inordinate amount of screen time set in the modern-day, with dubious and borderline tacky scenes of Dame Maggie, in the grips of dementia, puttering around talking to hallucinations of her late husband, Denis (Jim Broadbent), and assailed by memories of her life and political career. First we meet a young Margaret (Alexandra Roach) working in the family grocery store and braving air raids during World War II, then zipping off to Oxford and fighting her way into the boys club of politics, pausing just long enough to marry and have children. Streep then takes over the role of Thatcher when she is a secretary of education during the social upheaval and government breakdown of the ’70s, and is poised to become Great Britain’s first female Prime Minister. Unfortunately, by this point the movie is almost half over, and with a runtime of 105 minutes that leaves little room to cover the key points of her time in at the helm of the Empire. Instead we get a highlight reel of riots, ministers getting served Parliament-style, IRA bombings, and The Falklands War for Dummies, during which we are treated to a portrait of Thatcher that paints her as a well-meaning hard-case, a middle-of-the road approach that makes her come across as shrill, stubborn, self-righteous, and bullying — largely true, based on the way her own party turned on her in the end, but surely there’s more to the woman and her career than that. Much is put on the screen, but little is illuminated. It is from within this miasma that Streep is forced to project, and she largely does so with the fiery confidence that she’s known for. However, she’s hobbled by screenwriter Abi Morgan’s and director Phyllida Lloyd’s decision to let the story unfold strictly from the sketchy point of view of their “Margaret Thatcher”; that’s great in terms of defining their parameters as storytellers, but poor Streep is constrained by such a narrow focus.